Blog posts about the directions of the Medicine Wheel. The directions that the Four Winds travel. Each has a special meaning for all. As I write this post we are about mid-way in the time that the Spirit Keeper Waboose is strong in the Medicine Wheel of life. We are in the time of the North Wind a time of ending and beginning. Waboose (White Buffalo) watches over the spirits of those born under the moon sign of the Snow Goose, Otter, and Wolf. Roughly this is a time defined from December 22nd through March 20th on our calendars. Some strong lessons from the Spirit Keeper Waboose during the time of the North wind are that we are to accept life in it’s fullest, accept death as a natural part of life, and to accept that we need to share all that has been given to us. If we think of the winter of our lives, it is important to listen to Waboose and share those things given to us. Not just material things but most importantly the knowledge we have been given. When our physical bodies have entered into the North Wind of living we are older and wiser, elders if you will. Elders are responsible to share the history and culture with the younger people in their families. Passing on the ancient wisdom that was passed on to us when we were young is a giveaway practice that is very important. One that Native Americans have both known and practiced for centuries. As we are in the physical time of the Medicine Wheel ruled by Waboose (White Buffalo) we look forward to the changes that are to come and reflect on what we have or have not accomplished. We can use this time as a time of forgiveness and compassion for those who have wronged us or we have wronged. We can reflect on the White Buffalo (Waboose) who gave everything for the good of the people and see the ways that we might be giving for the good of the people of today, those we know and those we haven’t met yet. Mudjekeewis (Grizzly Bear) is the Spirit Keeper of the West and is also Chief Council of all Spirit Keepers and Animal Totems. His power is strength and introspection due to the West being the season of Autumn. West wind represents a time of strength gained from knowing yourself and a time of stability. The totem colors are blue for spiritual strength and black for looking within. The time of day represented by the West Wind and Mudjekeewis is evening and this can relate to a time in your life, where you are in your present journey, or the time of a specific project that you might be involved in. Mudjekeewis is your Spirit Keeper if you were born under the directly moons September 23 to October 23 (Raven), October 24 to November 21 (Snake), and November 22 to December 21 (Elk). The major lesson of Mudjekeewis is that of responsibility; responsibility for self, responsibility for the Earth, and responsibility for all of our relations on the Earth. Mudjekeewis, Father of all of the Winds, is under the element of fire and provides a home for the Thunder Beings. Mudjekeewis (Grizzly Bear) brings the gifts of maturity, of experience, and of expertise to our lives and our situations. Like all bears, the grizzly is extremely intelligent, cunning, and resourceful. A problem solver, Grizzly Bear, uses his hands and his heart to find ways to do things that will benefit both himself and his brothers and sisters in the bear kingdom. The grizzly bear is an animal that sometimes inspires fear in humans in much the same way the truly mature individual can inspire fear in those who are hesitant about reaching their own maturity. A person can be in the time of Mudjekeewis and not have Grizzly as their Spirit Keeper. It will be a time when people have established themselves. They have a career, a profession, family, and a home. They are stable and responsible. They have reached a point where they are carrying on their backs not only the young ones that they provide teaching, leadership, and healing to; but also the older ones who are no longer capable of caring for themselves as they once did. While the time of Mudjekeewis appears to be a straightforward time, it does contain a paradox. You will be experiencing your highest point of strength, but you are also aware of the little deaths that you see around you. You feel you could conquer the world and you become aware of your own mortality and what that truly means. The plant totem for Mudjekeewis is the cedar and the mineral totem is soapstone. The power of Shawnodese (Coyote) is trust and growth. Summer is the season of Shawnodese. It is a time of rapid growth, maturing, and testing. The animal totem of Shawnodese is Coyote with the medicine of Trickster. Some believe that the South Winds animal totem is Mouse with the medicine of Scrutiny. The totem colors are green for growth and healing and yellow for intelligence and natural wisdom. The element associated with Shawnodese of the Native American Medicine Wheel is water . The mineral totem is serpentine. Sagebrush is the plant totem. The time of life is that of our older childhood, adolescence, and young adulthood. This time of life can be physical or relate to where you are in your journey or a project that you are involved in. Shawnodese directly influences these moons: Strong Sun Moon (June 21 to July 22), the Ripe Berries Moon (July 23 to august 22), and the Harvest Moon (August 23 to September 22). Like the power of Waboose, the power of Shawnodese is paradoxical in nature. Shawnodese brings the time of rapid growth. A time when every being has to reach out for fulfillment quickly with no time to question the path laid down for it by the Great Spirit. The South is where we go to seek our visions. We ask the Creator to point us in the direction that we should go. Many times after the Creator has made this direction known to us, we have to follow it so rapidly that we must learn to trust our Creator and not question our path. Shawnodese gives us the gifts of energy, adaptability, maturity, playfulness, and humor to aid us on this new path. For many humans this time of Shawnodese is more of self-assurance and of acceptance. The time of the South Wind is when everything in our world truly seems possible, when the search for love is definitely one of our guiding forces and when we are particularly capable of giving and receiving love in many meanings of the word. The time of Shawnodese is a time of learning about relationships. The paradox of Shawnodese is that while all this outward and energetic activity is taking place and while we are learning to trust life and follow our own life path; the old trickster starts to play. Coyote is prepared to do whatever he needs to do in order to make us grow inwardly as well. The coyote means many things to Native American peoples. To some he is trickster in the most powerful sense. He is the sacred clown who urges life to keep crating itself. To others he is a form of the Creator. Some consider coyote merely a clown, a fool, one who tricks himself more than he tricks others. The animal itself also has many meanings to people. To some, coyote is a nuisance, a thief, and a scoundrel. To others he is a symbol of freedom and mystery. How fitting a totem he is for paradoxical Shawnodese. The favorite trick of the coyote is one very appropriate to this place on the Medicine Wheel. He makes you fall in love and most often with a person very different from you and from how you thought you wanted your mate to be. Attraction is the glue that draws people to these walking and talking human lessons of life. Love will be the cement that binds them together as long as they are willing to learn from each other. The South Wind under the guidance of Shawnodese is a good time to explore love and relationships. Explore the world around you and learn who you are and how that compares with who you feel you should be. It is a time to take the first strong steps toward your own maturity. When you are under the influence of Shawnodese you must be careful not to burn yourself out trying to do everything. You must be careful to use some common sense in your relationships. You must learn how to protect yourself, for this is one of the lessons necessary to grow into a mature human being. You must learn that there is a both a time to be open and a time to contain your energy and your feelings within yourself. Shawnodese is the place of the heart, the place of the emotions. It is here that we come when we need healing of the heart, when we need to learn how to love, when we need to learn to let go of all that is not love; hate, fear, envy, jealousy, rage and anger. The South Wind is the place to come if you are having problems with a relationship or if you are looking for a relationship. The Shawnodese (the stone of the trickster) will help you to understand why it is that you are drawn to a person and what you can do to help the relationship grow. You will learn about charm, nurturance, trust, gullibility, humor, and manipulation. Shawnodese will teach you about sexuality and sensuality and how they differ and how they are the same. Shawnodese is the power of love. The power of the open heart working in conjunction with the discriminating mind. The power of Shawnodese is the power of growth. The Spirit Keeper of the East Wind is Wabun or Eagle. Wabun shows us power through illumination and wisdom. The season of the East Wind is Spring. The time of awakening from winter’s rest, a time of vitality and purity of energy. The animal totem of Wabun is Eagle who gives us the Medicine of Spirit. The color totem is red which symbolizes vital energy. The time of day represented is Morning in the East Wind. Wabun, the Spirit Keeper of the East position on the Native American Medicine Wheel, is influenced by the element of air. This power totem is the Chief Animal Totem of the Budding Trees Moon, the Frogs Return Moon, and the Corn Planting Moon. Spring and the East Wind represent the time of our human lives of infancy and early childhood. This can be the actual time of life or the infancy or childhood phase of an idea. Also the infancy and childhood of where we are in our life path of spiritual learning. Wabun is straightforward in his power. It is that of new beginnings. Wabun brings the time of new growth to all of earth’s children. The time of Wabun is the time of freshness, newness, enthusiasm, and creativity. The East is truly a time of rebirth, a time when all things are possible. It is a time of innocence and a time of awakening. Wabun brings the eternal promise of spring. Wabun helps us to know that each moment can be a new beginning. The gifts of Wabun are the gifts of spontaneity, playfulness, wonder, inquisitiveness, and truth saying. Wabun brings the abilities to explore, to feel high energy, to be full of curiosity, to question everything, and to have the determination to see what is around the corner. People born with Wabun as their Spirit Keeper feel that they are the messengers of truth. The time of Wabun and the East Wind is a magical time both for the earth and for all of her children. It is a time when everything seems to be possible, when each breath, each moment is a new beginning, when incredible energy is available for growth on all levels. Some of the important lessons you can learn in the East are how to turn the knowledge of the Spirit outward and how to find a way to take this knowledge into the world. Wabun provides a good time to take advantage of your clear-sightedness, your ability to work with things of the earth while still remembering the lessons you have learned from other realms. The time of Wabun is the time of healing of the mind. This is the place we seek if we seek if we need to find the truth of life and get rid of any lies that might be binding us to old places that keep us from new beginnings. The powers of Wabun and the East Wind are those of truth, of openness, of illumination. Exploring Wabun will help you to know how to let the sacred energy that is the Creator flow freely and vitally throughout your whole being. Waboose is the Spirit Keeper of the North Wind. Renewal and purity is the Power of Waboose. The North Wind represents new life enclosed in death or new growth protected in rest. The Season of Waboose and the North Wind is Winter. That season can be about the time of year, the time in a person’s life cycle, or the time or phase of an idea. 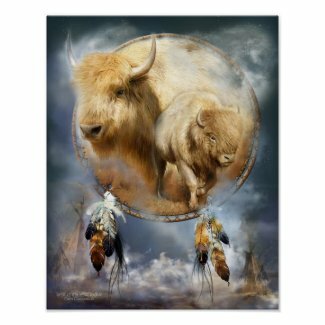 The animal totem of Waboose is the White Buffalo who gives us the medicine or lesson of Prayer and Abundance. The color totem for the North Wind is White which represents purity and balance. The time of day represented by the North Direction is Night. The North Direction on the Medicine Wheel is represented by the element of Earth and watches over people born to the Earth Renewal Moon, the Rest and Cleansing Moon, and the Big Winds Moon. It is symbolic of the time in our lives when we are the elders with our hair of white and also the time that we are newborns returning back into this world. The North is the most paradoxical time of the Medicine Wheel. It is the time when things seem to be sleeping. This apparent dormancy is a time for some of the deepest growth to occur. It is in the winter when seeds lie frozen within the earth that they take into themselves all of the earth’s energy that allows them to grow in the seasons that follow. It is in the north that our bodies cannot move as easily as they have in the past or will in the future. During this time we seem forced to take into ourselves the wisdom of the Spirit that we will use as we continue our journey. The time of Waboose is a time of slowing down, of apparent restriction, when outward activity definitely diminishes. It is a time of darkness, quiet, and dreams. It is a time when humans are fragile, when their skin is wrinkled and resembles the soil and the face of the Earth Mother herself. It is a time when people tend to reminisce and from their reminiscences share the wisdom they have gained. It is a time of assessing accomplishments and aims and of preparing for the major giveaway of death and of birth. It is a time when many people come to an understanding of their own life, and acceptance of what they have or have not achieved. It can be a time of peace, and a time of power, a time of forgiveness and compassion for all around you. It is a time to give up old patterns, to surrender to the small changes of body and mind in preparation for the major changes that will come. Waboose is a time of both ending and beginning. In the winter the earth appears dead, but there is much happening within. The same is true in human life. The major lesson of Waboose is that of the giveaway. When we are elders, it is our responsibility to give away to the people all of the knowledge that we have gained. We should tell our families what we have learned as we have journeyed around the Medicine Wheel of life. The white buffalo, Waboose, is an animal who gave up everything for the people: meat, hide, bones, and spirit. It is the White Buffalo Woman who gave the pipe to the people. The power of Waboose is acceptance of life, acceptance of death, and acceptance of the necessity of sharing all that has been given you.